Recently Google and LIFE together in a joint venture have compiled and published a huge database of millions of old and never to be found images. These images are availabe to public online via Google Image Search. The ability to search and find old photos of people, places, events, sports, culture etc makes this service unique, interesting and very useful specially for old image collectors. How To Search Only Old Photos ? Just add source:life at the end of your search term in Google Image Search and your search would only yield old images from LIFE Image archive. For example if I want to find old images related to baseball then you would have to enter baseball source:life to get old images related to baseball. 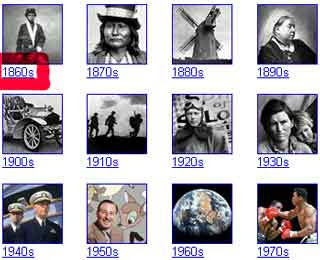 Or you can visit Google LIFE image archive page to search only from LIFE archive photos. All the LIFE photos are hosted on Google. LIFE archive of photos provide all kinds of photos (black and white as well as colored) that were taken centuries ago and were never published but now they have been degitized and made available to public. Pictures can be as old as from the 1970s and can be as recent as pictures taken to date. These photos are provided for free personal and non-commercial use only. When you click on a photo it opens in a new window along with some other interesting information about the photo. That information incliudes date the picture was taken, name of the photographer, actual size of the picture, related pictures and a short description about that picture. Remember that not all the photos contain the above mentioned information but most of them do. If you happen to find a really old image that you have been looking for and consider it very valuable then you are also provided option to order a framed image of that photo for as low as $79.99 .